Alternate Title: Of the things you don’t actually need, this one is the nicest. We’ve gone back and forth on the subject of wearables a lot here, and after much internal deliberation I went ahead and made the plunge on getting the Gear S3. With the launch of the Galaxy S8 right around the corner, now is as good a time as any to share my thoughts on how it fares in day to day use. The Gear S3 is Samsung’s answer to pretty much every other smartwatch that is striving for the “classic” watch appearance. While there have been other Samsung wearables before the S3, many of them were of such different designs and aesthetics that there was no way you could mistake them for anything other than a wrist mounted computer. The S3 comes in two flavors; the Classic (the silver one in the picture above) and the Frontier (the black one above). Being the watch snob that I am, I chose the Classic. 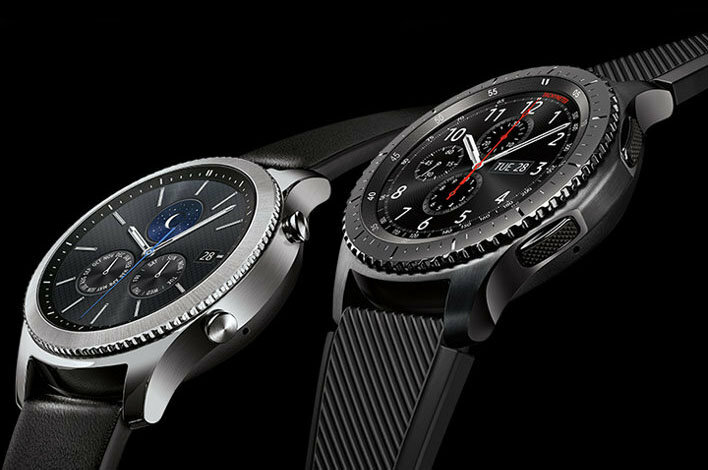 Opting to use their own Tizen platform instead of Android Wear like the Google wearables, Samsung made the S3 as stand-alone as possible: You can use this device with any type of smartphone, and if you really want, even use it with no smartphone at all. This is at once a strength and a huge weakness, which I will get into later. The onboard storage may seem anemic at only 4GB but there really isn’t any need for more and the watch itself never seems wanting for power with its 768MB of RAM and 1GHz CPU. This device has a LOT to love about it. The looks are certainly there and on more than one occasion someone has done a double take, pointed to my wrist and said “Oh, I thought that was a real watch!” (note: anything that sits on your wrist and tells time is, by definition, a “wristwatch”). The rotating crown is intuitive and a real classy part of the whole experience. All other wearables without it, including the previous S2, look downright cheap by comparison. 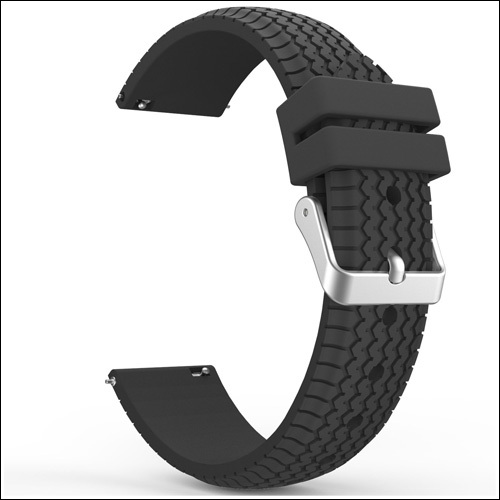 The watch can take any 22mm band, so you have endless possible looks going for you. However the really awesome part is the pin system that Samsung uses in the stock leather band (and has been mimicked by accessory manufacturers); instead of normal watch pins, these pins have a small handle that allow you to change bands on the fly and without the need of a jewelers kit! EVERY WATCH SHOULD HAVE THESE THINGS! Note the pins and the ends of the band. The screen is bright and easy to read in all light levels and the interface is intuitive enough that the learning curve is very forgiving. Despite being locked into its own ecosystem and eschewing Android, Samsung has loaded the S3 with enough apps and widgets that I really don’t find myself lacking any functionality (except one*). If your phone is too far away to use Bluetooth to communicate, the Gear S3 can still connect via wifi and give you updates and calls. And speaking of calls, I never thought I’d use the speakerphone feature on this thing but now I can’t live without it. Samsung Pay is easy to set up and super easy to use** and the built in integration with Samsung Health is great***. Samsung Pay** and Samsung Health*** integration are crap. Remember further up, when I said this thing was capable of being a standalone device if needed? What this really means is that this wearable doesn’t integrate with the Samsung Pay or Health already installed on your phone so much as it runs its own version in parallel. In the case of Samsung Health, it means it has its own client installed which then speaks to Samsung’s servers. If you have Samsung Health installed on your phone, it will then also speak with Samsung’s servers and sync the data that way. In the case of Samsung Pay, it needs to install a client on the device, another client on your phone, and all of that is independent of the Samsung Pay ALREADY on your phone (if you so qualify). This means the Gear S3 isn’t so much a second screen for your phone as it is an entirely separate device that uses your phone’s data connection and may or may not sync with services your phone might use. It’s a slight difference in paradigm, but it’s one worth noting. The accelerometer is also left wanting, as it often doesn’t have a clue what you’re doing. Doing some grocery shopping? If you’re like me and keep your hands on the shopping cart, then as far as the S3 is concerned you just did zero steps despite the fact that the built in GPS clearly has you going all over the place. Just did 5 flights of stairs? Sorry, it only counted one (or none, or 7). This is a real disappointment, as some of the guided exercises clearly rely on the sensor to track: Trying to be led in sit-ups by a device that can’t tell if you’ve even done one is a living nightmare. More than once I’ve had the S3 tell me “Good work, keep up this activity level!” when I’ve been doing nothing more than washing dishes. Also of note is the box that the S3 comes in. Yes, the box. In an effort to add functionality where no one wanted it, Samsung has made the box that the S3 arrives in capable of transforming into a charging station. You know, in case you want a huge paper/cardboard monstrosity on your nightstand? Someone once told me how using wearables would help your phone’s battery life because you don’t have to turn your phone’s screen on as much. I can tell you with full confidence that person is a dirty, dirty liar. While my S3’s battery can get me 2.5-3 days between charges (most respectable among smartwatches), my phone now has issues making it a full day. This is not a knock on the S3, as speaking with Apple Watch and Android Wear users have confirmed it as well. With the sole exception of smaller FitBits, it seems the sheer amount of constant communication between wearables and their paired phones is enough to drain all but the most robust battery. This is not a point against the S3 so much as it is an issue with the entire family of devices. Also, while using NFC payments with the S3 is a breeze, MST payments have never worked. Every time I’ve attempted to use this magical technology (which works just fine on my Galaxy S7), it has failed in spectacular fashion. I believe that this has more to do with the card readers in question than the Gear S3. The Gear S3 is the best looking and most fully realized wearable device currently on the market. Both of those statements are quite subjective, I realize, but it’s the only one that can convincingly look like an “actual” watch while simultaneously bringing smart functionality to such a degree. Even the S3’s method of charging (wireless, contactless with magnets to line up with the charging dock) just ooze class. Wearing the S3 on a daily basis has truly changed how I interact with technology as I rarely have a reason to pull out my phone anymore (unless I’m deliberately about to consume some media or play a game). I never miss texts or calls now and can carry out most interactions without even having to get my phone out of my pocket. *Really Samsung, you couldn’t give me an app to interact with my Samsung SmartThings hub! ?